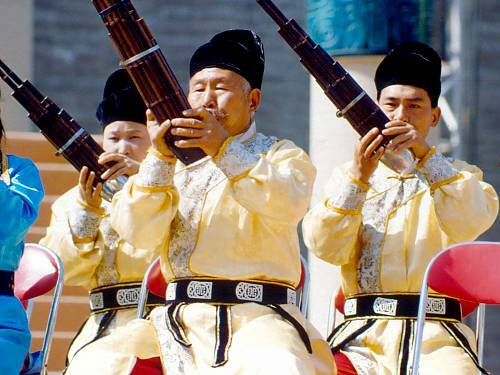 Xi’an wind and percussion ensemble, which has been played for more than a millennium in China’s ancient capital of Xi’an, in Shaanxi Province, is a type of music integrating drums and wind instruments, sometimes with a male chorus. The content of the verses is mostly related to local life and religious belief and the music is mainly played on religious occasions such as temple fairs or funerals. The music can be divided into two categories, ‘sitting music’ and ‘walking music’, with the latter also including the singing of the chorus. Marching drum music used to be performed on the emperor’s trips, but has now become the province of farmers and is played only in open fields in the countryside. The drum music band is composed of thirty to fifty members, including peasants, teachers, retired workers, students and others. The music has been transmitted from generation to generation through a strict master-apprentice mechanism. Scores of the music are recorded using an ancient notation system dating from the Tang and Song dynasties (seventh to thirteenth centuries). Approximately three thousand musical pieces are documented and about one hundred fifty volumes of handwritten scores are preserved and still in use.